MDC Alliance co-principal Tendai Biti was Thursday set free by Harare magistrate Francis Mapfumo who however banned the outspoken politician from issuing any political statements during the duration of his impending trial. The firebrand lawyer and Harare East MP-elect was Wednesday arrested in Zambia where he had crossed to seek asylum over an offence related to alleged announcing of the July 30 presidential election results. 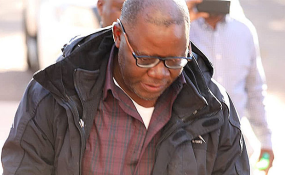 On his presentation in court Thursday, Biti was slapped with tough bail conditions which involved a deposit of $5000 and an order to report twice a day at the Harare CID law and order division. "As we speak, the bail fee is being paid but our client has been banned to attend political rallies or hold any press conferences," Denford Halimani, one of the lawyers from Zimbabwe Lawyers for Human Rights hired to represent the former finance minister told journalists after court adjournment. "He is to surrender his passport and title deeds to one of his properties in Harare. "He will reside at the given address. The court also ordered him to report twice at CID law and Order Section; twice a day between 0900 and 1800 hours. "His charges include contravening Section 66 of the Electoral Act, as in declaring election results." Prosecuting, Justin Uladi said Biti unlawfully held a press conference on July 31 during which he announced that their poll agents throughout the country had delivered information indicating that MDC Alliance presidential candidate Nelson Chamisa had won resoundingly. He is also facing a charge of inciting public violence as defined in Section 36 of the Criminal Law Codification and Reform Act. According to prosecutors, following his announcement, the next day 60 MDC Alliance supporters took to the streets demanding the immediate release of all the results by the Zimbabwe Electoral Commission. The MDC Alliance followers allegedly went to Simon Vengesai Muzenda bus terminus better known as fourth street where they destroyed property and vehicles. It is further alleged Biti arrived and stopped them before they both chanted MDC Alliance slogans. Court also heard he ordered protesters to destroy Emmerson Mnangagwa's banner while calling the President-elect a thief. He allegedly followed protestors who went to the Zanu PF headquarters leaving a trail of destruction along the way. It is alleged Biti also watched as the protestors destroyed the banners at Zanu PF headquarters including windows, cars and a bus. According to the state, property destroyed was worth $345 000. State did not oppose bail. Biti is being represented by human rights lawyers including Beatrice Mtetwa, Alec Muchadehama, Jeremiah Bamu, Gift Mtisi, Harrison Nkomo and others while Michael Reza and Jonathan Murombedzi represent the state.